A senior Russian diplomat has admitted that the unfriendliness by the US could cause Moscow to review its approach to the START agreement on cutting nuclear weapons and their delivery. “So far we have not taken any particular steps in this direction, but I cannot exclude that in the future Washington would force us into taking them, into making corrections to our policies regarding this direction,” the head of the Foreign Ministry’s Security and Disarmament Department, Mikhail Ulyanov said in an interview with the RIA Novosti news agency. “This would only be natural, considering the unfriendly character of the US actions,” the Russian official added. However, at the moment the strained relations between Russia and US have had no effect on the nuclear disarmament programs, the top Russian diplomat said. “The treaty is being implemented and it is implemented well. Both the American and the Russian sides agree that the process is progressing and neither of the parties have any complaints about the other. We hold that the circumstances that would force us into reviewing our attitude to the treaty have not happened yet,” Ulyanov told reporters. 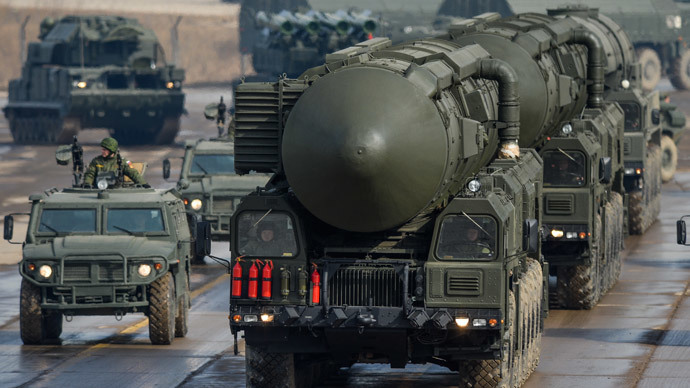 The active Russia-US nuclear weapons reduction treaty, the New START, allows each side to possess a maximum of 1550 nuclear warheads and 700 deployed carriers, such as missiles and bombers. The treaty came into force in 2011 and will expire in 2021. When US President Barack Obama suggested further cuts in nuclear arsenals in a speech in June 2013, Russian President Vladimir Putin replied that his country cannot afford such steps in the face of the latest US developments in missile defense and conventional strategic weapons. “We cannot afford to disrupt the balance of the system of strategic deterrence, to reduce the effectiveness of our nuclear forces. Therefore, the development of the system of space defense will remain a key direction for the military industry,” Putin said.